Online University For All Balances Big Goals, Expensive Realities : All Tech Considered The University of the People says it's the "world's first, tuition-free, online university," designed for poor students who would otherwise lack access to higher education. The institution has 1,300 students in 129 countries, but it's also struggling to maintain its "free" mission. Students work at the University of the People student computer center in Haiti. Students from 129 countries are currently enrolled with the institution. Naylea Omayra Villanueva Sanchez, 22, lives on the edge of the Amazon rain forest in Tarapoto, northern Peru. "Where I live, there's only jungle," Villanueva Sanchez says through an interpreter. "A university education is inaccessible." And that's true in more ways than one. 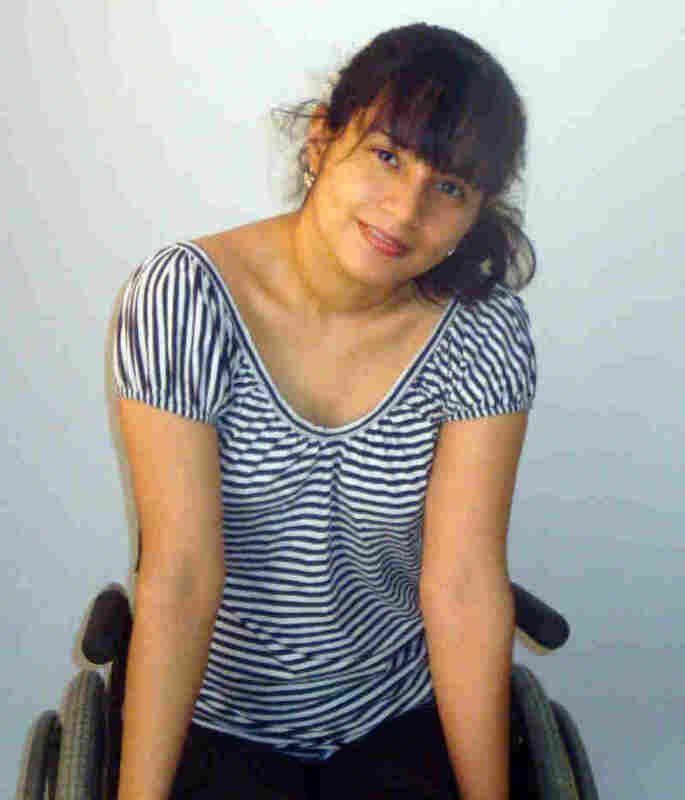 Villanueva Sanchez is in a wheelchair, the result of a motorcycle accident that left her paralyzed from the waist down. She is now enrolled in the University of the People, an online institution that claims it is "the world's first, tuition-free, nonprofit, online university." It's aimed at poor students around the globe who would otherwise not have access to higher education. 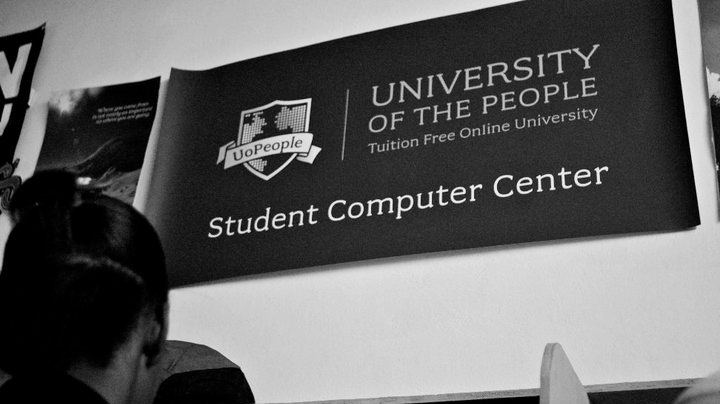 Villanueva Sanchez came upon the University of the People while surfing the Internet during her recovery. When she applied for admission, she had to verify she was at least 18 years old, had finished high school and knew English. She paid a one-time $35 application fee, but her business administration courses are free. She pays no tuition or book costs. "Of course, you see 'free' and right away you're suspicious," Villanueva Sanchez says. But after reading the organization's mission statement, she understood why it was free: She says it's for people like her, who don't have the opportunity or the money to attend college. That's precisely the goal, says Shai Reshef, the founder of the University of the People. Reshef runs the online institution with just two people. There's no campus, no visitors center — not even a sign over the tiny office it rents in a downtown high rise in Pasadena, Calif.
"And what you see is actually two rooms together," Reshef points out. "We own only half of this room." Naylea Omayra Villanueva Sanchez says her location near the Amazon rain forest in Peru, combined with a disability, makes a traditional university education impossible. Reshef founded the school in 2009. After making millions from several for-profit, online education ventures in the U.S., Europe and the Middle East, he says he realized just how inaccessible higher education is for most people around the world. "Listen, everyone should be educated," Reshef says. "I care about the people who don't have the right to an education right now, and they should have the right." Reshef says basing the University of the People in the U.S. was a no-brainer, "because students from all over the world want an American degree. They want to study, and want to find a job, and they want their degree to be recognized." The school currently has 1,300 students from 129 countries enrolled, mostly from Nigeria, Indonesia, Haiti and the U.S. Some work out of Internet cafes, downloading lessons on thumb drives to work on at home. In Amman, Jordan, Ali Patrik Eid, 33, usually logs on from work late at night. "Sometimes I read an assignment four, five, 10 times, and can't realize exactly what the instructor is talking about," Eid says. While Eid has struggled a bit with English in his business administration courses, he says his teachers, all retired professors from U.S. institutions, have been patient. There are many reading assignments and transcribed lectures to pore over, often followed by lengthy online discussions with classmates from around the world. But if students are paying little or nothing for all of this, can the University of the People grow and survive? In the short term, the answer is no. So starting next month, new students will start paying a $100 fee for every final exam. Even the school's most avid supporters worry about its growing operating expenses. "I have a bunch of concerns that we're all still trying to figure out," says Dalton Conley, former dean of social sciences at New York University. He's currently on loan to help the school expand course offerings. Thus far, the school offers only two- and four-year degrees in business administration and computer science. An open-source consortium provides instructional materials for free on the Internet, and Yale and Hewlett Packard are also partnering with the University of the People. Still, fulfilling the University of the People's lofty mission is not cheap, says Conley. "How are we going to make this work, while keeping it tuition-free and not having any onerous fees that would at all restrict access to the world's poorest of the poor, yet at the same time keep the organization growing? Shai [Reshef] once put it, 'We're not the future of higher education, we're the last resort,' " Conley says. Other educators have their doubts about the school and its effectiveness. "I think the concept of the University of the People is a nice idea," says Philip Altbach, head of the Center for International Higher Education at Boston College. But, he says, "I think it's a bit half-baked at this point. "The American higher education model has a great reputation," Altbach says, "but not all institutions live up to it." Altbach says some online education institutions have been plagued by scandal. "How, for example, will you figure out that the admirable woman in Peru is taking the tests herself?" he asks. Until somebody solves that problem, Altbach says, the credibility of the online degree is still suspect. "Many people are still skeptical, it's true," Reshef says. But, he insists, the University of the People will survive because the demand for a college education at little or no cost is so great. "We're building a model," he says. If we can do it, Reshef says, all of higher education "can do it for sure. So we're showing that it is possible." And that, says Reshef, is why soon, all of higher education will be watching.